Minions are so cute. 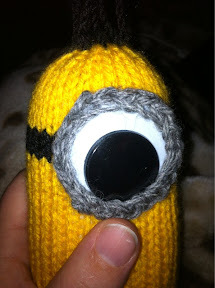 After making the minion hat, I decided to design this little guy. He is about 15-20cm tall, and far too cute. K2 tog over row. 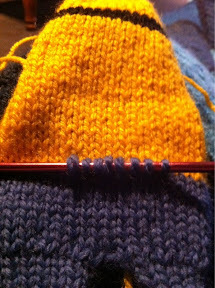 Cut yarn, thread stitches onto yarn, pull tight. 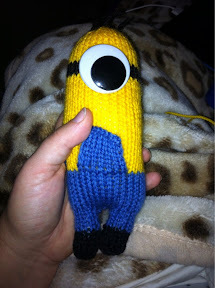 Using a crochet hook, pick up 9 stitches on the front of the minion, in the last row of blue. Cast on 4 stitches in grey. 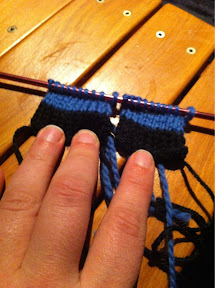 K2 tog over row, cut yarn, thread stitches onto yarn, pull to tighten. Attach twisted yarn hairs to the top of the head. Stitch up head and black strap. Stuff and sew up the back. 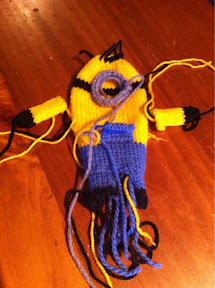 Sew up arms and attach to body. Attach eye to the front of the black stripe. Sew grey eye surround into a circle, stitch around the eye. 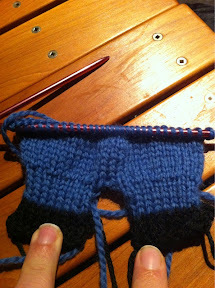 Run yarn around the side, and pull to tighten around the goggle eye. 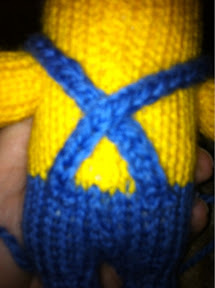 Attach straps to the back of the minion, crossing over his back. Attach to top of overalls with black thread. You are so talented!I love despicable me and where the wild things are. I’m checking out this awesome pattern, and I’m curious, is it done on double points? 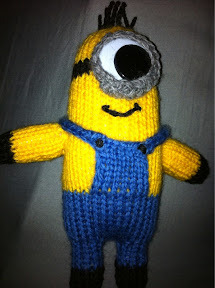 It is knitted flat on straight needles, and sewn up with a seam down his back. what size goggle eye does this need?? I used one about 40mm=50mm in diametre. Thank you for making this pattern, I’m sure my nephews will love it. 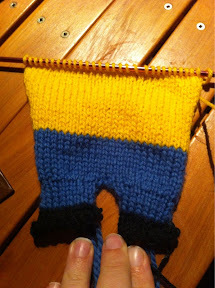 I need help Pattern says cast on 4 stitches grey knit 23 rows How do I make this a circle for the eye? If you knit the length of grey, then take both ends, and stitch them together, you will end up with a circle which can be stitched onto the hat. My daughter sent me the pattern and it only took a sort time to make. The kids will love them.